Out came her secret stash of ideas for a “she shed,” a trend gaining popularity among women who turn outdoor tool sheds or small barns into escape pods. Often, they’re filled with soft decor as cozy spaces for reading, yoga, crafts or contemplation. Sullivan’s husband, Jere, didn’t revolt. The couple and their two adult sons built her dream shed in three months, designing touches down to a secret floor hatch for wine bottles. Today, girlfriends visit and sip wine, or Sullivan goes there to craft gifts. She decorated the interior with colors and items she loves. Friends donated special touches, such as 1950s-era curtains. A white-washed wall came from a brother’s barn being torn down. Exterior touches include an old bicycle and the door’s painted address of 000. But Sullivan is far from alone, at least regarding this space conversion craze. Think opposite of a man cave. Like the State Farm commercial’s character of Cheryl, who wants a “she-ier” she shed rebuilt after her retreat catches fire, women across Spokane and North Idaho are staking their claim. 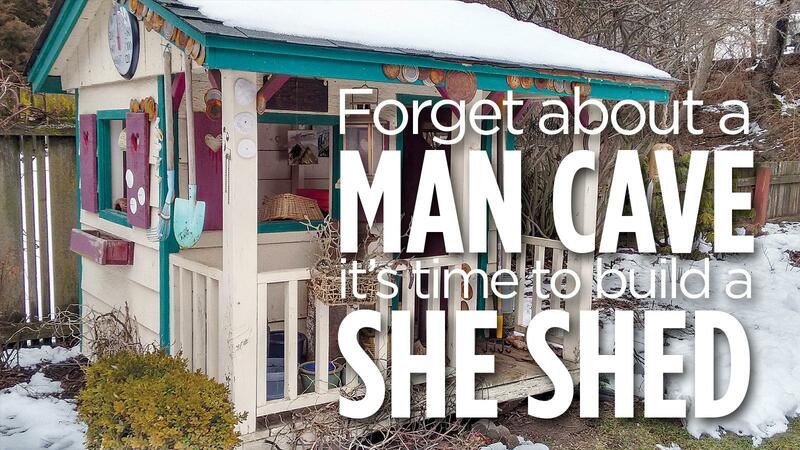 The Spokesman-Review recently asked readers to share their she shed stories, which opened the door to dozens of examples. Women told of turning structures into their personalized quarters to do puzzles, create paintings and crafts, write and read, play music or just relax. Some small spaces have heat and electricity — even wifi — to pull up a yoga video on YouTube. This past summer, Linda Hall of Spokane Valley received her she shed in a delivery from a Montana company that built it. Since then, she’s decorated the 7-by-11.5-foot interior in hues of blues and purples, her favorite colors. It has a small exterior porch. Inside, she has a table for puzzles or crafts. Hall’s shed has four windows and a door with a large window pane, so sunshine and air can circulate. Wind chimes hang along a ceiling beam, just because she likes them. Hall’s she shed and her husband’s shop are next door to each other. It was her turn, she said. Former Spokane teacher Christy Woolum now lives in Kellogg. Her she shed became central to the backyard a few years ago. She often goes there to write blogs. Because she and her husband downsized into a small home, the shed sometimes morphs its roles. The couple use the shed to host guests for meals, because it and the yard on warmer days offer space to entertain. This past winter, they overwintered eight geranium plants in the shed. But because the shed is mainly Woolum’s retreat, she put in her touches. “We filled it with a writing table, books, plants, comfortable furniture and favorite artwork,” said Woolum, 64. “The shed is filled with all the things I love in life. It’s provided her a quiet place to read, write, listen to music and arrange flowers from the garden. She writes essays, and might write a book in there one day. “Sometimes I take my laptop out there, and sometimes I use more paper and pen,” she said. “The writing table is right in front of the window. We just got the electricity and heat this last year, so that’s been real nice. We weren’t able to use it year round before. And there’s a ceiling fan for lazy, warm days. Her husband works on projects in the garage, but occasionally, they both retreat to the shed. In Spokane’s Garden Springs area, two retired women converted a stand-alone shop into their shared she shed space. Karen Port, 77, and Rhonda Hoener, 60, use it to weld metal yard art. Port’s husband, who died about four years ago, previously used the shop for projects. Port and Hoener, friends from work, have always admired metal artwork. In 2016, they took a series of classes through Spokane Community College’s yard art welding class. About a year ago, they pulled up their sleeves at Port’s property, to clean and organize the shop. They do welding art mainly as a hobby, said Hoener, who commutes to the shed once or twice a week from the Elk-Chattaroy area. They sell a few pieces at craft shows. Across town, Theresa Sullivan also does specialty artwork in her shed. She finds antique glass or metal doorknobs, attaches craft-store corks, and decorates the entire piece into wine stoppers as gifts. Inside the 8-by-12 feet shed, the Sullivans placed a loveseat hideabed as well as a workbench for completing those craft projects. “I have enough room because my work bench can fold down against the wall,” she said. “I can bring in more chairs, or people can sit on the floor. “Spring’s my favorite time because I can open all the windows and doors, and that’s when I start doing my crafting again, and I can read in the summer. I do have an air conditioner in there, so when I want to use it, it cools off within minutes. So Sullivan might use it for a short yoga session in the summer, or during freezing weather, the shed shelters guests sipping hot beverages. The family puts in a backyard skating rink each winter. After her husband had the idea for a secret floor hatch to hold her wine bottles, Sullivan thought of a perfect container to fit inside. She works as a funeral director. Based in Moscow, Connie Steiger wrote that her she shed becomes a ukulele playhouse. Steiger’s ukulele sat in the closet until 2013, when she heard about a local group forming up to play the instrument. She’s now part of the Ukulele Players of the Palouse. After that trip, she and others formed a band. But Steiger’s spouse kicked her out of the house when it came to practices. Other she shed stories describe pursuits of dreaming or creating. Teresa Wendel purchased a Spokane home that had a “prissy, purple playhouse” in the backyard. Pint-sized for a child, the structure barely had room to cram in a chair for a reading nook. Because she loves to raise plants, Wendel decided to turn the playhouse into her garden hut. The purple is gone. South Hill resident Joan Redman said her she shed nearly was a “he shed,” because her husband Ted planned to install a structure about eight years ago for yard equipment. Design changes intervened, when she saw sample drawings from the shed company. Ted got his shed, eventually. Redman and her granddaughter, now 11, have spent hours together in their cottage-themed one. Saralyn Gainer of Idaho wrote that her she shed was a marriage gift from husband, Ken. He was restoring the little barn as a workout room but gave it to her. Gainer uses it for quilting. Other present-day she sheds have had prior lives. In 2009, Lou Carver in Spokane turned a backyard chicken coop into a “shabby chic” space to do art projects with friends. Her home and coop, built in 1933, was created by Washington State University as an experimental farming area. By 1938, the property became private. “We are the fourth owners here,” said Carver, who once used the updated coop for formal art classes. But the past four years, “it has become a she shed,” Carver added. It’s mainly her hang-out. She’ll invite girlfriends and neighbors to work on fun projects. Catherine Henze, a retire academic, has spent summers near Lake Coeur d’Alene. Henze now finds inspiration as a writer, retreating to a she shed just above her lake cabin. That cabin itself, usually filled with guests and activities, wouldn’t work. The solution: an old two-seater 5-by-6-foot outhouse, a space that previously was converted into a workshop. “With my entire family involved, we leveled it with a car jack, wrapped it in Tyvek, sided it with cedar shingles, and added a non-leaking roof, two windows, a beautiful new door, and electricity,” she wrote. In Greenacres, Julie Schultz has a she shed that originally served as a World War II naval guard shack. It had many lives. In recent decades, it’s been re-sided and painted. New windows were installed. Dolores Turnbough, a Greenacres resident, said her husband built her shed using wood pieces that people gave them. He also installed an old church window from a garage sale, along with an old window from their house. The shed’s door had another life, too. It came from an old house their pastor was remolding. “It even has a hand-ringing doorbell in the center of it,” Turnbough wrote. Another spin on a she shed came from Sharon Berto of Coeur d’Alene, who has created what she calls her “grand illusion tea room” using a covered gazebo. In hues of purple and pink, along with long white curtains, the space is furnished with a small couch, several cloth-covered small tables, flowers, shelves and other decor. In Otis Orchards, Joni Omans also improvised. She converted a deck space formerly used for a hot tub into what she dubs her “woman cave” that she’s decorated with lights. “I have privacy blinds on one side that allows the breeze to come through to keep it cool and stir the wind chimes,” Omans said. Published: April 7, 2019, midnight Updated: April 8, 2019, 1:08 p.m.